Negril invented 'chill' – so get ready to embrace the laid-back spirit at this low-rise resort perched along Jamaica's famed Seven Mile Beach. From the moment you enter the open-air lobby you'll be caught up by fresh ocean breezes and the vibrant colors of the West Indies. Photo copyright Beaches Negril Resort. The vibe here is totally carefree and about spending time with those you love. Spread out over a lushly landscaped 20 acres, Beaches Negril epitomizes paradise with spectacular gardens beside the sea, a sprawling Pirates Island waterpark, and plenty of activities and amenities for the whole family. For those who want a little tranquility and a whole lot of cool, it all begins with a Negril beach vacation at our Beaches resort. 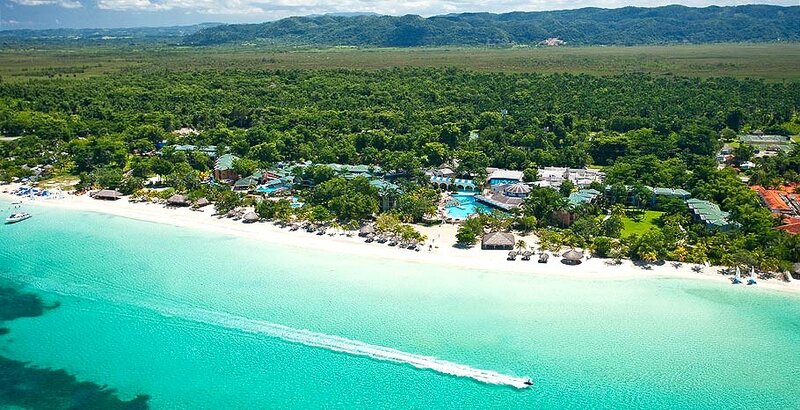 At Beaches Negril, classic island architecture blends harmoniously with a lush tropical setting, and families get to enjoy gracious surroundings that capture the true essence of the Caribbean. There are several unique room and suite categories to accommodate families of every size, yet no matter which one you choose, you'll always enjoy luxurious accommodations that include custom-crafted furnishings and lavish baths, with a level of service that raises the bar for all other family resorts in the Caribbean. The spice of life rules at Beaches Negril. After hours of playing in the tropics, ravenous appetites are satisfied by savory meals, any time of the day or night. For food lovers of all ages, seven world-class restaurants fulfill every culinary fantasy with a world of choices. From fresh seafood served right on the beach to wood-fired, made-to-order pizzas, each restaurant offers a unique ambiance from the casual to the refined. And while each has a distinctive menu, all deliver service with a warm smile. Everything at Beaches Negril has been designed to take advantage of its position along Negril's famed Seven-Mile Beach. Whether in the water or on land, kids and grownups alike can find plenty to keep them entertained, or just totally chilled out. Those looking for some exhilaration can find it here, perhaps with a vigorous game of tennis, a little windsurfing or even just sliding down a waterslide. For those just looking to catch some rays, a chaise by the pool or on the beach waits. The beach fun does not stop when the sun goes down. Here, you can experience fine dining barefoot, right on the beach at Stew Fish, our latest addition to the already comprehensive restaurant choices.You'll also enjoy weekly beach parties featuring a variety of Caribbean and food, music and live entertainment. If you're looking to relax and rejuvenate while on your vacation, then take a journey down the path to pampering at Red Lane® Spa, where you'll discover a serene sanctuary. This is where classic European spa rituals are infused with the truly distinct essence of the Caribbean. Utilizing exclusive Red Lane® botanical products and essential oils, we promise you'll discover a sense of ease and calm found only in our tropical paradise. With over 20,000 sq.ft., Beaches Negril features one of the largest and most comprehensive spa facilities in Jamaica. Negril invented "chill" – so get ready to embrace the laid-back spirit at this low-rise resort perched along Jamaica's famed Seven Mile Beach. From the moment you enter the open-air lobby you'll be caught up by fresh ocean breezes and the vibrant colors of the West Indies. Bringing the outside in, this Negril all-inclusive resort is always open to the breathtaking beauty of the tropics. Pros: Fabulous Beach! The hotel has many private, quiet areas. This property has a fun yet relaxing vibe.